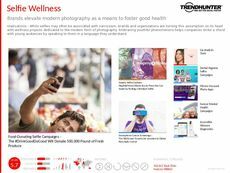 Find Better Ideas, Faster ® with a custom narcissism trend report, our PRO Dashboard and 80+ categories of premium trend reports. 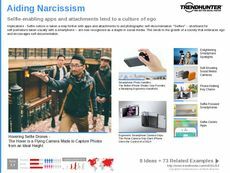 The Narcissism Trend Report is an insightful study into products, services and technologies that promote self-centered interests in consumers. Especially in young Millennials and Gen Z, self-promotion through social media is widespread. Personal branding has become the norm and selfies have become ubiquitous. 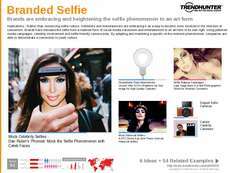 Apps and attachments that are designed specifically for taking selfies are common. Retail brands and marketing teams have begun to capitalize on this, encouraging selfies with products as a way of enlisting free marketing through social media sharing. This report will specifically help marketing teams aiming to reach the young Millennial demographic and members of Gen Z. Fashion, tech and other retail store owners and sales executives will learn how to use this narcissism productively, by setting up selfie mirrors and social sharing campaigns. The Narcissism Trend Report captures ways to use a once negatively viewed trait productively in the retail, promotion and marketing world.